Mohu Leaf 50 is the original amplified version of the world’s first paper-thin HD TV antenna with omni-directional capabilities that reach out in a 50-mile radius from your home to bring you the most popular over-the-air TV shows, news, weather and sports on both network and local television- absolutely free after the purchase of the antenna. It’s mult-idirectional. You don’t aim it. Now there is no need to pay costly cable and satellite fees to watch your favorite stations, such as PBS, ABC, CBS, NBC and Fox. The Leaf 50 is derived from advanced U. S. Military technology and is combined with Mohu’s CleanPeak filter technology to eliminate unwanted cellular or FM signals. Channel reception varies based on what is broadcast in your area, your distance from broadcast towers, and any geographical obstructions between you and the towers. Before you buy, visit http://dtv.gov/maps to see what channels are available in your area. Comes with 1 Year warranty. Email the company at support@gomohu.com for help setting up your product. You can also visit www.gomohu.com. The Mohu Leaf 50 hd tv antenna comes with an extra-long 16 foot cable and 15 db gain antenna amplifier with CleanPeak filtering technology that filters out cellular and FM signals, letting you pull in a clearer picture, receive more channels, reduce dropouts and increase your overall experience with broadcast television. The amplifier’s patent pending USB powering option boasts an impressive 15db of gain across the entire television broadcasting band, allowing the weakest signals to be received and viewed. The amplified antenna turns on and off with your television when using the TV’s USB port to power the amplifier. Coupled with the clarity of over-the-air broadcast signals, this delivers a superior picture quality than is possible through the compressed cable or satellite broadcast signals. The top 96 out of 100 most viewed shows on television are broadcast over-the-air in the United States according Nielsen. Why pay for these channels when you can receive them for free? Plus, with free, over-the-air TV you will get better HD quality than you can get with either cable or satellite. Digital television broadcasts are uncompressed, resulting in the best picture quality offered today. The Leaf has proven itself to be the category leader in performance and style by numerous independent tests and reviews. Depending on what is being broadcast in your area, you’ll soon be able to watch popular national TV networks and local TV shows at no cost. The Leaf 50 can pull in all of your local news, weather, sitcoms, kids and sports programming with no monthly contract or bills. The Leaf 50 is multi-directional and does not have to be accurately pointed toward the television towers, meaning that you can receive broadcasts from multiple towers without readjusting the antenna. The majority of reviewers for this product left a high rating and were nothing short of completely satisfied with their purchase. That is not to say that the product is without flaws. To be fair to the manufacturer of the product, 53% of buyers who left a review for it gave it the highest possible rating, and many of these buyers talked about how well-pleased they were with its performance. 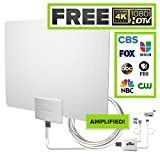 Some buyers stated they were able to pick up over 30 free channels using the Mohu antenna. The issue we have with this particular antenna is that about a third of reviewers express their complete frustration that they are not able to pick up any channels at all with it. This is not a cheap product. When a buyer pays a lot for a product, they expect to get some use out of it. There were many customers who purchased this antenna and felt as though they got nothing at all for their money. As this sounds negative please keep it in perspective that these customers probably didn’t have a clear line of site to the broadcast towers. I can’t say this enough. If you are in a very wooded area or in a city with tall high rise buildings, you need to get the most powerful antenna you can get because it will be a struggle to get the signals. The one indoor antenna that we found works the best is the FL5500a Winegard digtal antenna here. It’s not easy to recommend a product that works for some consumers and not for others. Fortunately, this antenna comes with a pretty good return policy, so customers who want to take a chance that it will work out for them will at least have the option of returning it, if it doesn’t work for them. Give a try to this antenna NOW and Click Here for the Best Price on Amazon!